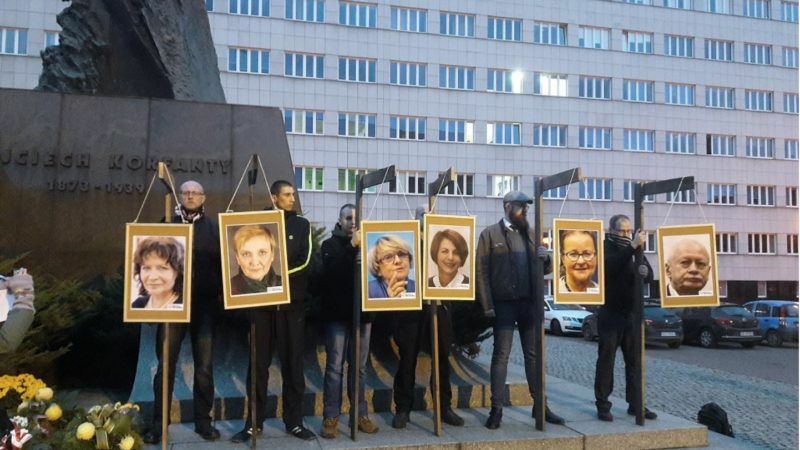 Poland’s justice minister announced an investigation on Monday (27 November) after mocked-up pictures of opposition MEPs allegedly hanging on gallows were unfurled at a far-right demonstration on Saturday. Zbigniew Ziobro said on public radio that a preliminary inquiry into the incident in the southern city of Katowice will be launched, in order to shed light on what actually happened. Six MEPs from the Civic Platform (PO) opposition party voted in favour of a resolution adopted on 15 November by the European Parliament denouncing judicial reforms in Poland as a threat to the fundamental values of the European Union. According to VoteWatch, those who voted in favour of the resolution, are Michal Boni, Danuta Hubner, Danuta Jazlowiecka, Barbara Kudrycka, Julia Pitera and Roza Grafin von Thun und Hohenstein. All of them are from the Civic Platform, which is affiliated to the centre-right European People’s Party (EPP), the largest political group in Parliament. Polish socialist MEPs, also in opposition, abstained. After the vote, the six were accused by the ruling conservatives of acting “against their country”. In addition, European Parliament President Antonio Tajani announced Monday that he would ask Polish Prime Minister Beata Szydło to “ensure the security of elected members of the European Parliament”. I will write to PM @BeataSzydlo to ensure the security of elected Members of the European Parliament to express their opinions independently, without threat and oppose those who spread hatred by exhibiting outrageous pictures of hanged politicians. Such members must be able “to express their opinions independently, without threat and oppose those who spread hatred by exhibiting outrageous pictures of hanged politicians,” he wrote on Twitter.